Lobaria pulmonaria grows on a mature tree (photo: Wikipedia). Congratulations to Jocelyn Campbell (UBC PhD Candidate) and her co-authors on their recent publication in the Canadian Journal of Forest Research. The research took place at various locations within Aleza Lake Research Forest and surrounding ecosystems. 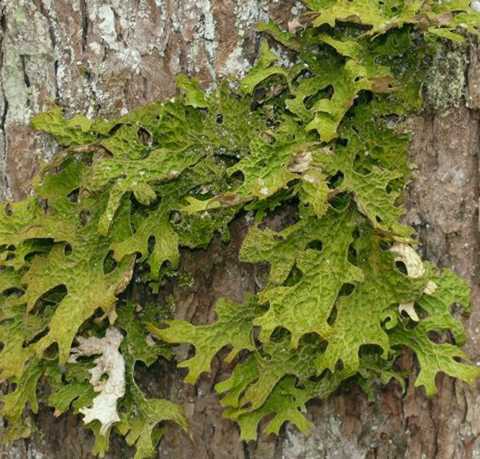 The paper describes a study on cyanolichens, a type of lichen that grows in wet climates and old forest conditions. Cyanolichens that grow on trees are picky about where they live. For example, this paper cites other studies that have shown cyanolichens are more abundant and diverse on sub-alpine fir trees (Abies lasiocaropa) then they are on hybrid spruce (Picea glauca x englemanii). In fact this paper shows that one of the places that cynolichens are happiest is on conifer saplings that grow under aspen (Populus tremuloides) or cottonwood (Populus trichocarpa). This unexplainable association was even stronger in study sites where conditions for cyanolichens were marginal, including those at ALRF. The research doesn’t end there. ALRF and Jocelyn have plans to work together and take this study one step further by creating mini-lichen reserves around aspen and cottonwoods in future harvest blocks. The objective will be to see if these deciduous species can help cyanolichens survive the light and moisture changes caused by removing the stand around it. Source: Campbell, J., Bradfield, G.E., Prescott, C.E , and A.L. Fredeen. 2010. The influence of over-storey Populus on epiphytic lichens in subboreal spruce forests of British Columbia. Canadian Journal of Forest Research 40: 143-154. Previous PostUpdate on Larch and Cedar seedlingsNext PostNew ALRF Trail Maps!